Bigger doesn’t always mean better. 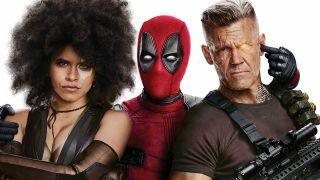 But by adding another two of his fan-favourite creations in the shape of Cable (Josh Brolin) and Domino (Zazie Beetz), Deadpool creator Rob Liefeld says the Merc with the Mouth’s second big- screen outing is a step up from 2016’s inaugural instalment. With the leading comic book writer/artist comparing it to the leap from 2011’s Captain America: The First Avenger to 2014’s Captain America: The Winter Soldier, the sequel significantly boosts the stakes and broadens the breadth and scope of Wade Wilson’s increasingly deranged world. “No one expects the second movie to be a smaller film,” admits Liefeld. “People expect the follow-up to expand, and Deadpool 2, by having Cable and Domino involved, easily fulfils that promise.” With Deadpool clocking in at a relatively succinct 108 minutes, Liefeld believes that audiences didn’t actually get to spend as much time as they would have liked with Ryan Reynolds’s inspired turn as hyperactive mutant mercenary, Wade Wilson. Arriving hot on the heels of Avengers: Infinity War, Liefeld suggests that Deadpool 2 will be something of a palate cleanser after the Marvel Cinematic Universe’s most ambitious and wide-ranging crossover to date. “Infinity War is in pole position as it comes out three weeks ahead of Deadpool 2, so it’s demanding a lot of attention,” reasons Liefeld. While its budget is reportedly not much larger than its predecessor, Leitch has been granted a bit more leeway on Deadpool 2. “When people ask, ‘What’s the most impressive thing about Deadpool 2?’ I tell them, ‘I’m just impressed by how far back we can pull the camera on this one’,” says Liefeld. Rather than Cameron’s classic T-800, Cable owes more to Lee Majors’s The Six Million Dollar Man, which was adapted from Martin Caidin’s 1972 novel Cyborg. “The Terminator was a complete robot while Cable only has one cybernetic arm just like Steve Austin in The Six Million Dollar Man,” says Liefeld, who first joined New Mutants as penciller with 1990’s issue 86 before also assuming writing duties with issue 98 in February 1991. “Cable then comes into this as a commando-type man of action, who takes no prisoners, which was just what was needed.” rather than Professor X or Magneto, Cable was based on the equally enigmatic Wolverine. “I modelled him after my favourite man of mystery, who to this day is my favourite mutant,” reveals Liefeld. Along with the return of Cable, New Mutants #98 saw the debut of not only Deadpool but also domino, who was inspired by one of Liefeld’s favourite childhood pastimes. “A lot of the characters that I've developed have been built up around a visual and a name,” he explains. “People are always asking me, ‘Where did that character come from?’ but I was literally a collector of names, and I've always had a sketch pad. Domino was always female, and she played off the black and white motif of an actual domino. "Deadpool is about having a good time." As the latest trailer appears to indicate, Deadpool 2 seems to lead directly into the establishing of X-Force. Spinning out of 1991’s New Mutants #100, the mutant black-ops group’s original members included Cable, Domino and the regenerating degenerate himself in addition to other Liefeld creations such as Shatterstar and Feral. This feature originally appeared in our sister publication SFX magazine, issue 300. Pick up a copy now or subscribe so you never miss an issue.